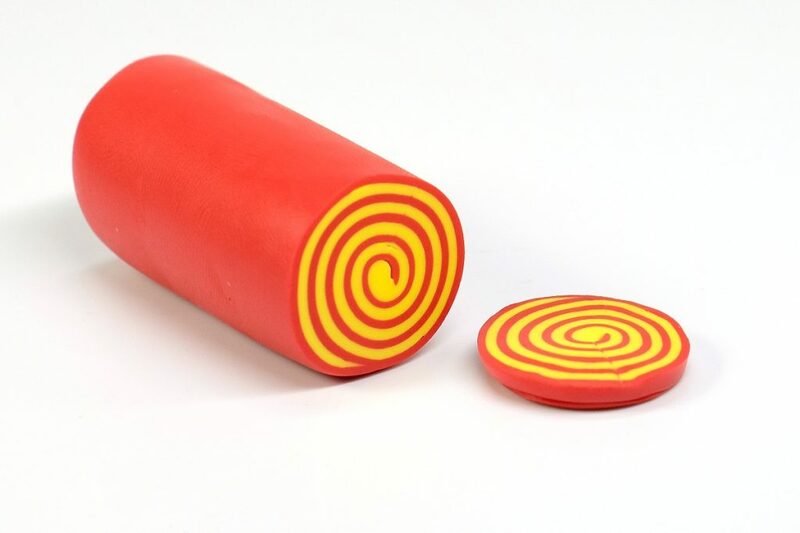 A polymer clay cane is a log of polymer clay that’s made with a design that runs the entire length of the log. Slices from the cane will reveal a design and all slices from the cane will have identical designs. 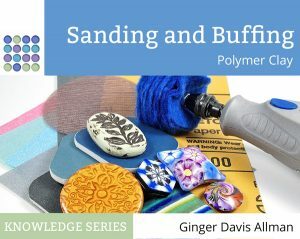 A polymer clay cane can be reduced by squeezing and compressing. This makes the diameter of the log smaller and the design smaller. Learn about reducing square canes here. Polymer clay canes are similar in concept to murrine, which are glass canes used in traditional Venetian glassworking. Be aware that polymer clay canes are not correctly called millefiori. Millefiori is an Italian term that means “thousand flowers” and is also borrowed from glassworking. Millefiori is where many slices of murrine are arranged to make designs you’ve seen in glass paperweights and other traditional glass designs. When slices of polymer clay canes are arranged to make a field of flowers, this can be called millefiori. Millefiori buttons and beads made from slices of polymer clay flower canes. There are hundreds of “standard” cane designs, such as flower (rose, pansy, etc.) or leaf canes. I’ve collected some common ones here so you can get an idea of what they’re called. In addition to the basic canes above, there are also “famous” canes such as the Pixelated Retro Cane by Bettina Welker and the Stroppel Cane by Alice Stroppel. There are many favorite ways to store canes. The trick is to find a way that lets you see what you have without allowing them to get dirty or stick together. Some people wrap them in deli sheets. Personally, I like to keep them in scrapbooking boxes, as you can see in this article here. You can group your canes by type or artist. They stick well to the glass sheet I’ve placed in the bottom and that allows them to remain vertical. Canes pictured are from Ivy Niles of IKandiClay, Matt Kernan of Clay by Kerm, and Toni and Ed Street. A their most simple, you can cut a slice of a polymer clay cane and pierce it to form a bead. Slices of square canes can be arranged like tiles to make a uniform surface. Sheets of millefiori designs can be used to cover things such as crochet hook handles, tin lids, or small boxes. Cane slices can be shaped to make sculptural forms, perhaps with each slice forming the petal of a flower. Canes are used anytime you want to create the same design over and over. An example would be to create a signature emblem for signing polymer clay artwork. One fun way to use canes is when the slices themselves are treated as components to “paint” a picture in a sort of mosaic style. Alice Stroppel’s Cane Mapping technique is an example of this process. Which Clay to Use for Making Canes? Because there can be lots of distortion when reducing canes, it’s best that a soft and smooshy brand of clay is not used. Sculpey III is too soft for making any but the simplest canes. While it is a great brand for making free-form canes, Sculpey Souffle doesn’t allow the fine detail needed for complex picture canes. For those canes, artists often prefer to use Fimo Professional or Kato Polyclay. There are thousands of cane tutorials out there. A simple google search will reveal tons of them. Even though complex designs are tempting, learn to make simple canes first. Doing this will give you the basic skills for building, packing, and reducing canes. Also, many complex canes are built from basic subunits like bullseye canes. A good library of basic canes can be found in an old favorite site, Polymer Clay Central. They’re “oldies but goodies”. 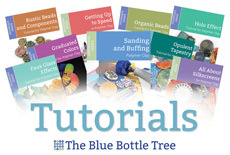 A recommended source of new cane tutorials is Meg Newberg’s Cane Builder Subscription. Above all, be patient, take your time, and enjoy. Making and using polymer clay canes is a rewarding and useful skill. Note: Some of the canes pictured were provided by Toni and Ed Street and Matt Kernan.